The new figure of 1.7 percent, down from the WTO's previous estimate of 2.8 percent in April, marked the first time in 15 years that international commerce was expected to lag the growth of the world economy, the trade body said. "We need to make sure that this does not translate into misguided policies that could make the situation much worse, not only from the perspective of trade but also for job creation and economic growth and development which are so closely linked to an open trading system," the report quoted him as saying. The data underlined concerns that, after a long period of growth through globalisation and reliance on global trade, governments are increasingly seeking to protect their own industries and promote domestic producers at the expense of foreign competitors. Although all governments deny protectionism, trade is no longer outpacing economic growth as it used to. 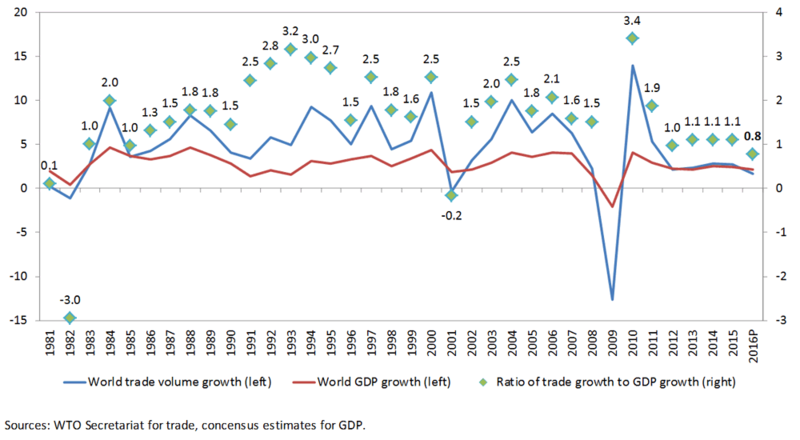 Trade has grown 1.5 times faster than gross domestic product over the long term, and twice as fast when globalisation picked up in the 1990s. This year trade will grow only 80 percent as fast as the global economy, the WTO said, the first reversal of globalisation since 2001 and only the second since 1982. "I am absolutely convinced that this is not a moment to turn inward," Azevedo told a WTOconference. The benefits of trade should be shared more widely, he said, with a system that does more to include poor countries, small firms, marginalised groups and entrepreneurs - an apparent nod to anti-globalisation activists who say that secretive trade talks are exclusively aimed at helping big business. Azevedo said four out of five job losses in industrialised countries were not due to competition from cheap imports but to automation and efficiency campaigns that allowed firms to cut their workforce. "This is not a rose garden," he said. European Trade Commissioner Cecilia Malmstrom, speaking alongside Azevedo, said trade had to be efficient, valuable and transparent. "The time that we locked ourselves in a room and came up with a trade agreement... and only the most devoted nerd really cared, those times are gone. That's not how it works any more." Many people do not feel included in trade policy debates any more, Malmstrom said. "There's a growing anti-globalisation movement. There are fears, questions, and we also see the figures that you presented this morning that absolutely give reason to be concerned."